Archery tag is an epic adrenaline rush unlike anything you have experienced. It combines the classic game of dodgeball with the thrill of paintball. Archery tag is a safe and unbelievably exciting experience that becomes more challenging as the game goes along. Archery tag is perfect for company team building activities, bachelor parties, family night out or date night! Family-friendly archery tag that everyone can enjoy! No previous archery experience required and safe for all ages. Our skilled staff will train all players thoroughly prior to each game! Perfect for birthday parties, bachelor parties, team building events, corporate events, and Greek events! Looking for great team building activities? Looking for a unique party activity that none of your friends have tried before? Look no more! Archery tag is a fantastic sport that everyone can enjoy! 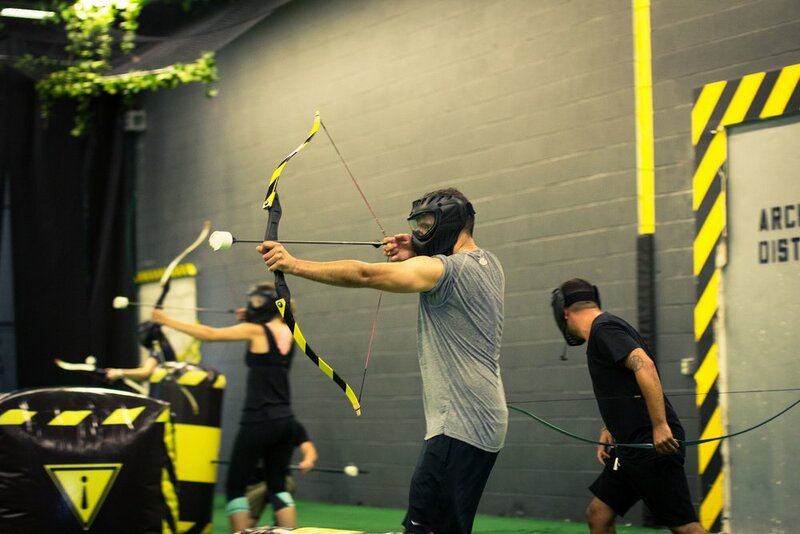 Archery tag is a lot like the game of dodgeball, only with specialty made foam tipped arrows! The ultimate objective is to eliminate the other team by tagging them with arrows. Archery tag is safe and fun! The impact of an arrow feels very similar to getting hit in dodgeball! Archery tag is perfect for team building and makes for a great birthday party, bachelor party or date night!